A large number of youngsters have body art or tattoos made on their body. A lot of them do want to remove the permanent tattoo after some time but may not go for it due to the risk of scarring or pain. Laser tattoo removal is the answer to your wish! Permanent tattoo removal through laser treatment is a much more efficient and reliable treatment as compared to older techniques that were used to remove a tattoo. Earlier the techniques that were used to remove a tattoo were not that effective. In fact, conventional tattoo removal techniques have a history of scarring the affected area. There are no risks involved in laser removal of tattoos. The process is simple. 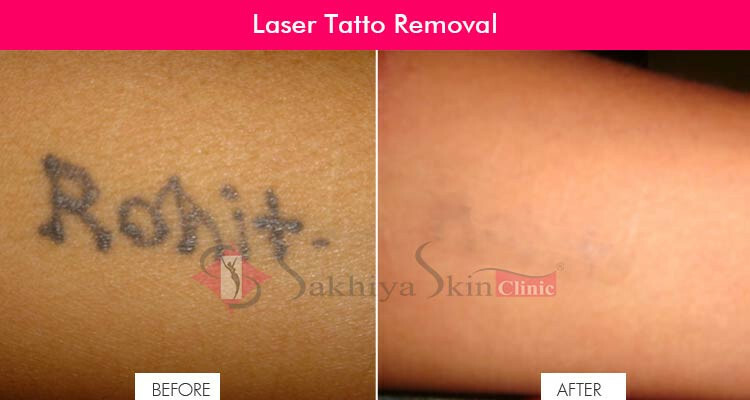 The tattoo is exposed to the laser rays, which are absorbed by the tattoo paint. The rays destroy the tattoo ink molecules and hence remove the tattoo. Usually, 2 to 4 sittings are required for tattoo removal. Tattoo removal clinics follow a methodical process for conducting laser tattoo removal. First, they protect the eyes by covering them. Then, laser rays are emitted on the tattoo. Usually, the practitioner observes the light rays for some time to ensure that the right intensity and colour of the light is used. This is decided on the basis of the colour of the tattoo ink, depth of the tattoo and the skin tone of the patient. With each sitting the tattoo gradually fades away. The treatment works the best on blue and black ink tattoos. Usually, anaesthesia is not required. But, sometimes a doctor may use a cream or local injectable anaesthesia depending on the pain threshold of the patient and the place of treatment. The cost of laser tattoo removal depends on the size, color and the place of the tattoo on your body considering the depth of the ink. Usually, there are minimal risks involved in a laser tattoo removal procedure. The skin near the tattoo does not get damaged. Very rarely the laser treatment may leave a scar. However, it is important to take precautions as the tattoo area is susceptible to infections. The doctor will usually give an antiseptic cream to be applied. They will also apply a cool pack to take care of the discomfort. HOW DOES LASER REMOVE a TATTOO? The Q-Switch laser uses photo-acoustic energy to penetrate into the skin and safely target the tattoo at its core. Each pass of the laser causes the tattoo ink to vibrate and gently shatter into micro-particles that are eventually eliminated through natural body processes. Patients describe no pain to mild pain like a pinch followed by a feeling of warmth in the treated areas. We apply anesthetic cream before the procedure and also cool your skin before and during the treatment to help numb the area that is being treated. It takes longer to remove a tattoo than the time it took for the same tattoo to be made. It takes from 6 to 12 sessions (4-6 weeks apart). It depends on the number of colors used in your tattoo, the size of the design, the type of ink used and the age of tattoo on your body. Larger tattoos may take more sessions to achieve optimum results. Smaller tattoos [especially black tattoos] are easier to remove than larger multi-colored designs. ARE THERE ANY PRECAUTIONS TO TAKE DURING THE TREATMENT? As with all laser treatments, you must avoid exposure to direct sunlight before the treatment, during the treatment and for some weeks following the treatment. WHAT ARE THE VISIBLE EFFECTS ON THE TREATED AREA AFTER THE SESSION/S? After several treatments, you will notice a temporary whitening of the area that has been treated. Over time, the tattoo fades and the skin returns to its normal colour. Side effects, though, are very rare. Adverse ones could include scarring, pigmentation, bacterial or viral infection.